Those, he said are the basics of life that we need to learn at an early age. With that in mind, I decided that I wanted to do confirmation class a little bit differently this year. Kind of get back to the basics. You see, in previous years we have talked about a lot of very broad topics. Running the gamut from an overview of Church and Methodist History, to several basic Christian beliefs, to the administration of the church, to the missions and ministry of the church. And we did that all in the course of seven or eight weeks. Do you know how hard it is to keep 6th graders focused on anything for an hour much less topics such as these? 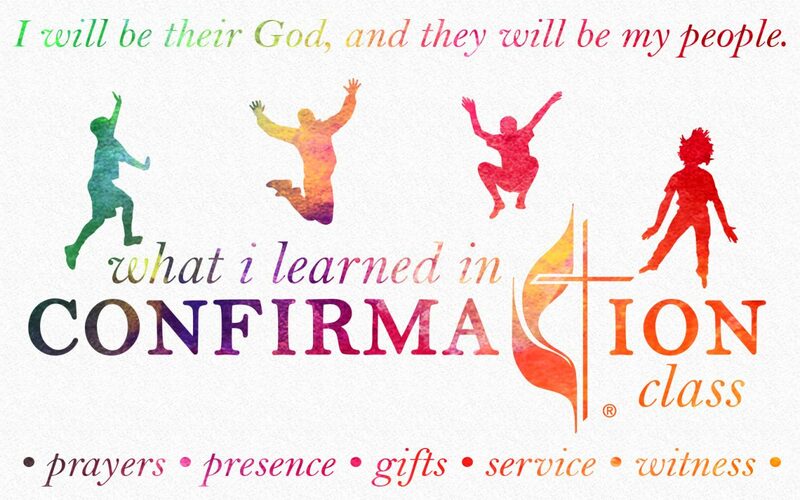 And so I thought back to my confirmation experience a few years ago, which was thirteen weeks long, and I’m sure touched upon all those things but I don’t really remember. In fact, when I look back on confirmation I don’t recall learning anything about Church or Methodist History and Theology, or basic Christian beliefs, or the the administrative structure of the church. Not that all of that is not important, but it just didn’t stick with me as a 6th grader. No, what I learned in Confirmation class that has stuck with me all these years was much more basic than that. First, that church membership is all about being in Covenant with God and with one another. It really is as simple as that. Jeremiah describes it this way when near the end of his often complicated and dark prophecy concerning the state of the people of God which included many things like war and exile and the total destruction of Israel by foreign invaders, he writes that faith and hope in the midst of chaos and tribulation, all comes down to one thing. Our relationship with God. Because in the end, when all else has seemingly passed away, all that’s left is our covenant with God. I will be their God, and they will be my people. And when we boil down everything that the church tries to require at the time of confirmation, the only thing that matters is that covenant that we make with God. So the first thing I remember learning in confirmation class, is that when we join the church, we enter into a covenant relationship with God. Now covenant, implies a legal contract between two or more parties. In legal terms one party agrees to provide a good or service, and the other party agrees to pay for it. If you do this, then I will do this. I had an Old Testament professor in Seminary who said that because the Old Testament is basically an ancient law book, it is easy to track the condition of the people and the church by determining the condition of the Covenant between God and the people of God. And you know, he was right. Every time there is a significant turning point in the relationship between God and humanity, God takes time to restore the Covenant. At the time of creation, God says to Adam, I will be your God and give you dominion over all the earth and what does the Covenant require on Adam and Eve’s part. Basically a relationship with God based upon love and obedience. But when Adam and Eve disobey, the covenant begins to break down. And humanity drifts away. So God contracts with Noah to build a giant boat to house all of the animals on earth and then wipes the slate clean with the waters of the great flood, just as we are wiped clean by the waters of Baptism. And when the waters clear, God tells Noah to repopulate the earth and “I will be your God and you will be my people.” To Abraham God says go to the land I have set aside for you, and I will be your God, and your people, who will be as numerous as the stars in the sky, will be my people. But humanity did not keep their side of the bargain, they abandoned the land and so the covenant broke down. So out of Egypt, He called to Moses, and in the wilderness carved the terms of the covenant out in stone, Ten Commandments on how to be God’s people. But before Moses could even get down from the mountain with the stones, the people had already broken the covenant. To generation after generation God offers the covenant, only to be rejected time and again. Until in Jeremiah’s day there is little left of the land of milk and honey. And to a people in Exile God says all I have ever wanted is to be your God and for you to be my people. Jeremiah calls us back into covenant relationship with God, but in time humanity once again breaks the covenant. And so what does God do. He sends His own Son to us, to be the new Covenant, the Word becomes flesh. And Jesus establishes the church through which every generation can enter into covenant relationship with His Father. So that whenever we gather, we can be assured that God is still our God, and we are still called to be His people. And when we are confirmed, when we join the church, we take our place as the Covenant people of God. So while I’m sure that we talked about Church and Methodist History, and basic Christian beliefs when I was in Confirmation Class, I have to say that not much of that stuck with me. No what I learned that stuck with me was pretty basic. When we join the church we enter into a covenant with God to live the lives that we were created to have, that He has wanted for us all along. Jesus confirmed that when He told the disciples, I came so that you would have life, and not just ordinary life, but abundant life. I learned in confirmation that our lives lived in covenant with God are meant to be extraordinary. And looking back on my life so far, I rejoice that God has been true to His word. Even when sometimes (often times) I haven’t. Life lived in covenant with our loving God is truly an abundant, extraordinary life. He has blessed me beyond measure. And then I will ask them if they will support the church through their presence. I learned in confirmation class that when the writers of scripture talked about the presence of God, they were almost always talking about worship. Because when we worship, we enter into God’s presence. The Book of Revelation is very clear that eternity will be spent worshipping around the throne of God. Day and night we will worship. Worship will be our passion in eternity, and as people in Covenant with God it must be our passion now. Worship is the primary way that we show our love and gratitude for God and nothing in the church or the world should keep us from that. All throughout the Old Testament, when the people of God reached a milestone in their faith journey, God commanded them to stop and build an altar on that very spot and why – so they could worship Him. Because when we worship we come into God’s presence and celebrate all that He has done for us. When Rick Warren wrote his book The Purpose Driven Church he wrote that the number one reason the church exists is to worship God. And in the sequel The Purpose Driven Life he says the first reason that we exist is to worship God. Everything else we do – whether it be service like God’s Pantry or small groups or fellowship or Sunday School – begins with, is empowered by – worship and that when we place other priorities above worship – then our covenant with God begins to break down. I learned in confirmation class that Christians, covenant people, must be about the worship of God, and not just occasionally, not just when it suits us, fits our schedule, our lifestyle, pleases us, but always and forever, because when we worship we truly experience the presence of God. And nothing in this world should stand in the way of that. And then I will ask them if they will support the church through their gifts. It was in confirmation class that I learned the concept of tithing – that through our tithe we express our love and gratitude for all the blessings of God. And so I began to put 10% of my weekly allowance in the offering plate. And when I got my first job, making 1.25 an hour, I tithed. After Karen and I got married, even though we had very little – we still tithed. And now all these years later, through a lot of good times and a few not as good – we are still tithing, in fact going beyond the tithe in sharing our gifts. We don’t tithe because it’s a duty, we tithe in order to express our love for our God of unlimited blessings and love for us. But I also learned in confirmation that tithing was not the only way that we share our gifts. I learned that God blesses us with unlimited time and talents and abilities – gifts – and challenges us to give back in proportion to our love for Him. I would later learn that lesson the hard way. The summer following my High School graduation, God challenged me to not just give my tithe and a couple of hours of my time to be in church on Sunday. If He was truly my God, and I was one of HIs people, and if I truly loved Him like I said I did, then I needed to give more. I needed to give my whole self. All my talents and abilities, all the blessings of God, all my gifts, needed to be given back to God. But when God called on me to live in to the Covenant with my whole life, I said “no, God. I know I promised to support the church through my gifts, but I think I give enough, do enough, to live up to my end of the covenant. I have other plans and dreams that I want to pursue.” And so I started to run away from the Covenant. I established many other priorities in my life – apart from God. My focus became more and more on things of the world. And in so many areas my life and my relationships began to suffer, particularly my relationship with God, and my dreams started to fade. And after several years of running, four years of college and one year of law school. I finally remembered what I had learned in confirmation class about loving God with my whole self, not just a partial expression of self. And I prayed, “Lord I am so tired of running from you. Forgive me for my selfishness and use everything that you created me with in the first place to your glory.” And instantly God renewed the covenant in my heart. I will be your God, and you will be one of my people. You see, I learned in confirmation class that Covenant people support God and the church with all of the gifts that God gives to us in the first place. Imagine all that St. Luke could be doing, how spectacular our worship could be, how full our Sanctuary would be, how many lives we could be impacting, how many disciples we could be making, if all of us were sharing even one tenth of our whole being to support God and in His church. That’s what I learned in confirmation class. And then I will ask them if they will support the church through their service. It’s simple really. Scripture tells us that when we serve others, we serve God. But the opposite is true also: when we don’t serve others, then we fail to serve God. When we serve others, our service expresses our love for them, and for God. As covenant people we love and serve God, when we love and serve others. “When did we see you hungry and thirsty and in prison, Lord, and serve you.” “When you served the least of these, you served me”. Jesus says. I learned in confirmation class that if we truly love God and desire to serve Him, then we will love and serve others, no matter the cost. And then I will ask them, if they will support the church through their witness. It is only in the last few years that the church has added witness to the membership covenant. And here’s the thing. Prayer, presence, gifts and service are all essential to who we are as people in Covenant relationship with God, but for those things to truly lead us into a life of discipleship, going to the ends of the earth to make other disciples as Jesus tells us, drawing other people into Covenant relationship, we must tell people about why we pray and who we are praying with, and why we worship and who we are expressing our love to when we worship, and why we share our lives, our gifts and abilities, and who it is we are giving our gifts to. Because God will take our shared gifts, our blessings, and use them to bless others. You know I used to really appreciate gifts given anonymously to the church, but through the years I have come to understand that part of what makes gifts truly special, even life changing, is in the knowing – the who and the why the gifts are given. I learned in confirmation class that if we truly love God as expressed by our prayers and our worship and our giving and our service, to share that love, we must tell people about it. We’ve got to tell people about our God. And then the final thing I learned in Confirmation Class is that Jesus gave us the church to be that place on earth where we can truly live out our covenant relationship with God. And that’s why we join the church. It is an acknowledgment that we are all in this together – in covenant with God and with one another. And so every time we welcome a new class of young people into the church family, and every time someone comes into the church and they say yes I will take my place among God’s covenant people, it is also an invitation to each one of us to take a hard look at where we are in the world and the church, and ask: What is the condition of our covenant with God? Are we loving Him completely through our prayers, and our worship, and our gifts, and our service, and witness. Or do we need to come kneel beside these young people, and ask the Lord to renew His covenant in us, even as He establishes His covenant with them?